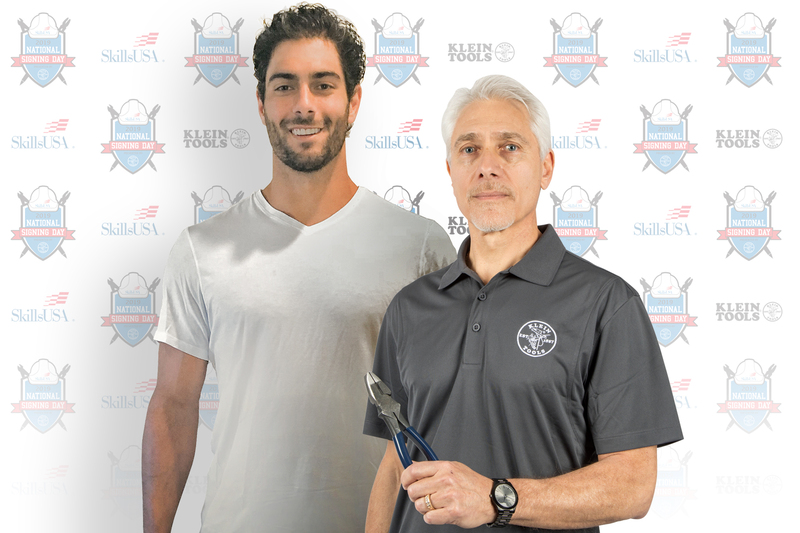 April 11, 2019 (Lincolnshire, Ill.) – NFL Quarterback Jimmy Garoppolo has signed on to participate in SkillsUSA and Klein Tools first-ever National Signing Day on May 8, 2019. Jimmy and his father, Tony Garoppolo, a recently retired career electrician, will be attending the Silicon Valley Career Technical Education in San Jose, California, one of the approximately 300 schools participating in this special event, to celebrate high school seniors signing “letters of intent” for a career in the skilled trades. “Just like Signing Day is an unforgettable moment for high school athletes, it is just as important for students who choose to pursue ongoing technical education. My father, an electrician for over 40 years, supported me and my family with a stable and rewarding career. Having witnessed firsthand the hard work, skill and dedication it takes to be an electrician, I applaud the students who are taking that next step to a gratifying career in the skilled trades,” says Jimmy Garoppolo. On National Signing Day, thousands of high school seniors across the nation will be recognized for their decision to pursue a career in residential wiring, building trades and renovations, HVAC or plumbing. In a style similar to “National Signing Day” events for high school student athletes, Klein Tools will host Facebook Live segments showcasing seniors announcing their career plans and signing “letters of intent” for a job offer, apprenticeship or advanced technical training. Jimmy Garoppolo and his father will be interacting with students across the country via live video feed on Klein Tools’ Facebook page. “We are thrilled Jimmy and Tony Garoppolo are partnering with us for this national inaugural event recognizing the tradespeople of our future. Together, we will be able to generate awareness of the many benefits a career in the skilled trades offers, especially among today’s younger workforce. And together, with our partner SkillsUSA, we will be able to help to contribute to closing the major skills gap facing our country today,” adds Klein Tools Co-President Mark Klein. More information on National Signing Day events and participating schools can be found at: www.kleintools.com/nsd. SkillsUSA is a vital solution to the growing U.S. skills gap. This nonprofit partnership of students, instructors and industry ensures America has the skilled workforce it needs to stay competitive. Founded in 1965 and endorsed by the U.S. Department of Education, the association serves more than 360,000 students and instructors each year in middle schools, high schools and colleges. This diverse talent pipeline covers 130 trade, technical and skilled service occupations, the majority STEM-related. More than 600 corporations, trade associations, businesses and labor unions actively support SkillsUSA at the national level. SkillsUSA programs are integrated into career and technical education through a framework of personal, workplace and technical skills grounded in academics. Local, state and national championships, designed and judged by industry, set relevant standards for career and technical education and provide needed recognition to its students. SkillsUSA also offers technical skill assessments and other workplace credentials. For more information, go to: http://www.SkillsUSA.org.